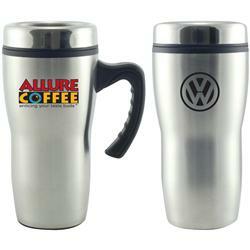 A bargain, the custom Stainless 16 oz.Stealth Mug is perfect as a customer gift, employee reward or holiday gift. Your choice of tumbler or with a handle for the same low price. Worried about the quality, the style? Ask for your free sample! Features stainless steel with plastic liner, foam insulated with a push-on lid. Comfortable handle for easy carrying. Sturdy but affordable, the Stealth Tumbler is great for customer give-aways, employee gifts and company events. Comes with a free gift box. Too many mugs to choose from? Email sales@adcomarketing.com for quick help. On special now at 144 pieces! Typical Imprint Area(s): Imprint area H x W x Wrap 1-3/4 x 2-3/4 x 7-3/4. 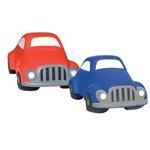 Available Imprint Options: Second color imprint add $0.56 each. 16 oz. stainless steel with plastic liner, foam insulated. 24 per case at 20 lbs. 004-8864 with handle, 8865 without handle.